Lightning, it appears, can strike twice. 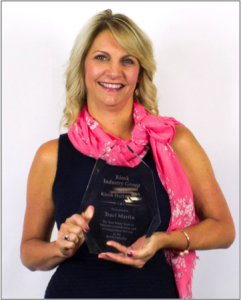 The Kiosk Industry Association has announced that Traci Martin, director of vertical markets for Olea Kiosks, will be inducted into the group’s prestigious Kiosk Hall of Fame, becoming the company’s second executive to receive the mantle. Inductees are nominated by their peers as a way to recognize the honorees’ contributions to the advancement of the kiosk and self-service industry. She joins Frank Olea, CEO of Olea, who received the nod in 2013. Members acknowledged Martin’s long and successful career in the industry. She has been with Olea for four years and served the kiosk industry for 17 years, making her one of the earliest advocates of self-service technology. Martin has worked with hundreds of companies, deploying kiosk solutions in the ticketing, wayfinding, gaming, human resources, retail and government sectors throughout the U.S. and around the world. She currently serves on the Kiosk Advisory Board and the PartnerTech Retail Advisory Board. Frank Olea shares her enthusiasm. According to the Kiosk Industry Association, candidates and nominations are solicited from all participants in the kiosk industry. Thirty nominations were received for 2017 with only a few receiving the requisite votes for induction. Other inductees for 2017 include Tommy Woycik of NEXTEP SYSTEMS, Ben Wheeler (a.k.a. the Kiosk Guy), James Vande Castle (former editor of KIOSK Magazine) and Nigel Seed (NAS Consultancy). Eric Dumouchel of Ultimedia and Tommy Wincent of Swecoin received posthumous inductions. Martin’s election to the Hall of Fame continues a strong year of recognition for Olea Kiosks. Three of its products were named as most innovative kiosks in their respective categories by the editors of a leading trade publication, and this month, its Verona Healthcare Kiosk was named by the publication as the most innovative self-service solution of the year among all categories. Olea Kiosks is a Los Angeles-based designer and manufacturer of kiosks for multiple industries, including QSR and fast casual dining, healthcare, gaming and financial services. In business for more than 40 years, the company builds “better kiosks through intelligent design” and serves clients across the globe.